Temperature measurement and monitoring are critical for processes that synthesize ammonia for nitrogen fertilizer production. WIKA USA’s multipoint thermocouple assemblies feature high temperature sensors designed to withstand the harsh condition of ammonia applications. Growers routinely use nitrogen-based fertilizers to replenish the soil and improve crop quality and yields. The United States alone consumes 11.8 million tons of nitrogen-based fertilizers annually. Ammonia (NH3) can be used directly as a fertilizer, or as feedstock to produce other forms of fertilizers such as ammonium nitrate (NH4NO3), urea, and urea ammonium nitrate (UAN) products. Temperature monitoring and control are very important when synthesizing these fertilizers – thus the need for accurate high temperature sensors that can withstand harsh conditions. The three main stages of producing nitrogen-based fertilizers are syngas —> ammonia —> urea. Urea is the most widely used nitrogen fertilizer because its final form – small, dry pellets – is cheap and easy to transport. Urea contains 46% nitrogen, the greatest concentration of this element among nitrogen-based fertilizers. To produce urea, which has a chemical formula of CO(NH2)2, you need ammonia. And to manufacture ammonia, you first need a supply of hydrogen. There are two main ways to produce hydrogen. One involves a gasification process in which hydrogen is isolated from organic or other carbonaceous materials. The more common method, accounting for 85% of total production, is steam methane reforming (see figure above). This process uses high pressures, high temperatures (in the form of steam heat, or H2O), and a catalyst to convert natural gas/methane (CH4) into synthesis gas (step 1). Also known as syngas, this fuel gas is composed mainly of carbon monoxide (CO), hydrogen (H2), and some carbon dioxide (CO2). Air, which contains 78% nitrogen, is introduced at this stage. 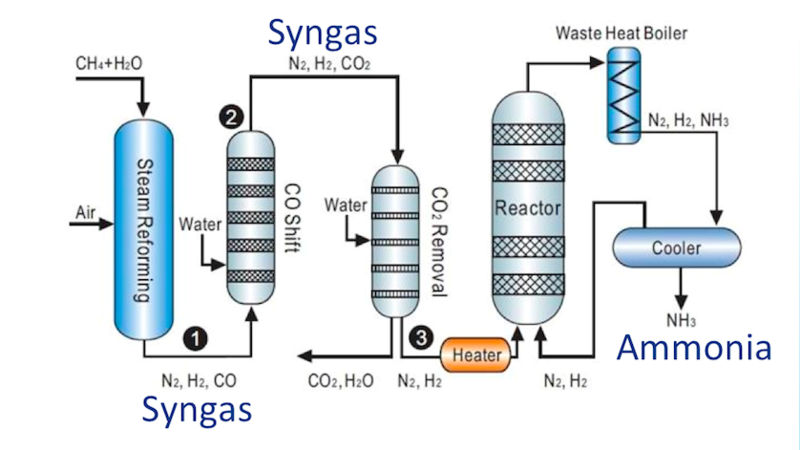 Using CO shift reactors and CO2 removal units (steps 2 and 3), the syngas now has a very high concentration of hydrogen. The mostly H2 syngas, along with the nitrogen introduced earlier, enters the ammonia synthesis reactor. This reactor uses high pressures, high temperatures, and catalysts to separate N2 into individual atoms (N), which are then combined with H2 to produce anhydrous ammonia (NH3). For ammonia producers, the primary consideration is human safety. NH3 irritates the eyes, the nose, and the throat. In high enough concentrations, it can burn skin, damage lungs, and/or cause blindness. Measuring instruments don’t have it much easier. Ammonia is highly caustic, and extremely high temperatures are necessary to produce the compound. Over time, both conditions tend to damage standard equipment, causing them to become unreliable – and the plant to lose efficiency. There is no room for safety hazards, shortened equipment life, equipment failure, or process inefficiencies in ammonia production. The associated dangers, downtime, and costs can be significant. An accurate temperature profile requires many temperature measuring points. The high temperature sensors in WIKA USA’s multipoint thermocouple assembliesgive ammonia producers the data they need to draw accurate, real-time temperature profiles throughout the reactor. This information allows operators to better monitor and control the reaction process. Multipoint thermocouple assemblies are the ideal solution for temperature profiling of high temperature and low temperature shifts (LTS), and of ammonia synthesis reactors as well as the CO2 removal units, methanators, and ammonia converters typically used in ammonia production. Ammonia production poses many challenges. Multipoint thermocouple assemblies can help producers of nitrogen-based fertilizer achieve safer, more efficient operations. Contact WIKAto learn more about our high temperature sensors, innovative temperature solutions, and comprehensive professional services for the fertilizer industry.